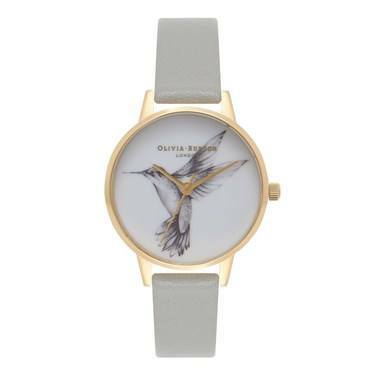 Olivia Burton have been inspired by nature with this beautiful hand illustrated hummingbird design. The grey strap perfectly compliments the gold case and gives this vintage style watch a modern twist. Not very fast delivery. Promised the package will be sent in a day after I payed the order, but actuall that was three days later. Also I tried to contact with the site and get my own reference number so I could track the package. I was told once I chose the Royal Email, there's no way I could track it. I was really confused. Anyway yesterday I received this watch and it is really pretty. Worth all of the troubles.